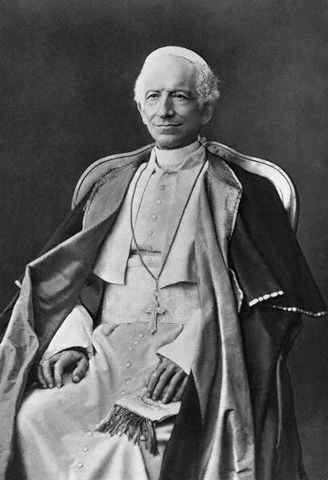 Leo XIII (secular name: Vincenzo Giocchino Pecci), b 2 March 1810 in Carpineto Romano, Italy, d 20 July 1903 in Rome. Pope in 1878–1903. During his papacy a number of initiatives were undertaken in relation to Eastern rite Catholics, including the reformation (1882) of the Basilian monastic order, the creation (1885) of a new Stanyslaviv eparchy, and the founding (1897) of a Ukrainian theological seminary in Rome. Leo XIII also endorsed the resolutions of the Lviv Synod of 1891, and proclaimed (1894) the edict Orientalium dignitas Ecclesiarum, confirming the principle of territoriality enunciated in 1890 by the Sacred Congregation for the Propagation of the Faith. The edict limited the jurisdiction of Eastern ecclesiastical authorities to their traditional territories, thereby effectively placing immigrant Ukrainian Catholics under the authority of Latin rite hierarchs in North America. This measure led to considerable dissension and was a major factor behind the conversion of thousands of Catholic Ukrainians to Orthodoxy or other denominations. Leo XIII placed three Halych metropolitans (see Halych metropoly) in office and made Sylvester Sembratovych a cardinal (1895). He also ordered the preparation of a plan for a Lviv-based Ukrainian patriarchate that was opposed by the Hungarian Roman Catholic primate because the new body would incorporate Transcarpathian eparchies.